Nizar Ashraf 2 years, 6 months ago. Here is the much awaited Nougat 7.0 ROM for Galaxy ACE 3 LTE CyanogenMod 14 (CM14). In addition to this we also have the Galaxy ACE 3 LTE Lineage OS 14.1 ROM. For latest updates, stay tuned to the Lineage OS 14.1 device list page. This Nougat 7.0 has come for Galaxy ACE 3 LTE via CyanogenMod 14 ROM. Since Google released Android Nougat Source code, we have update many Android NOUGAT AOSP ROMs and also many CyanogenMod 14 ROMs updated and many are yet to come. This Galaxy ACE 3 LTE for CyanogenMod 14 is brought to you by developer kotzir. Earlier kotzir had brought the Galaxy ACE 3 LTE CM13 Marshmallow ROM. If you like his work and want him to keep up his work, then you can Donate him via PayPal using this link. Download and Copy the GApps and Galaxy ACE 3 LTE CyanogenMod 14 ROM ZIP to your phone. Reboot and Enjoy the CM14 for Galaxy ACE 3 LTE. 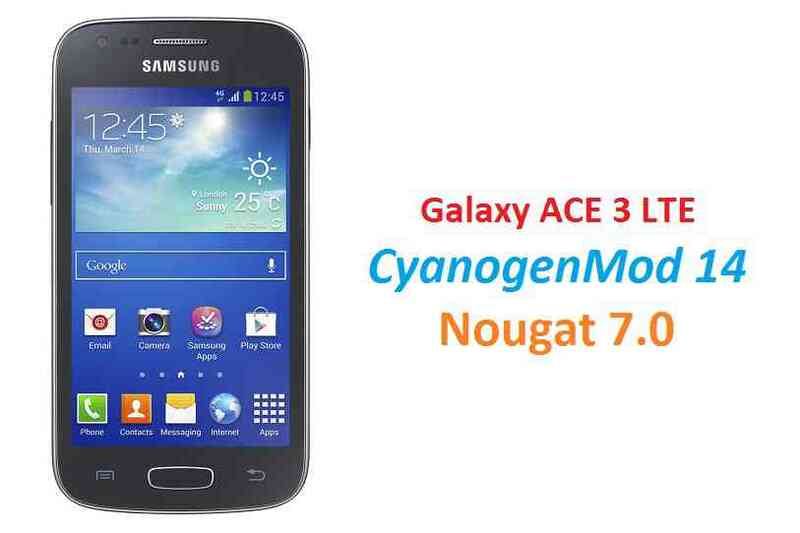 Copy the latest Galaxy ACE 3 LTE CyanogenMod 14 ROM ZIP file to your phone. Stay tuned or Subscribe to the Galaxy ACE 3 LTE forum For other Android Nougat ROMs, CyanogenMod 14 ROMs, other ROMs and all other device specific topics. You Can find the Development page of Galaxy ACE 3 LTE CM14/CyanogenMod 14 Nougat 7.0 ROM, here.